There were few surprises in the team selections. From Manchester City’s perspective, Bernardo was chosen to play centrally, alongside Raheem Sterling preferred over Leroy Sane. Naby Keita was ruled not fit enough to start, but entered the match a half hour into the game for James Milner due to injury. Joe Gomez was also named instead of Alexander-Arnold. 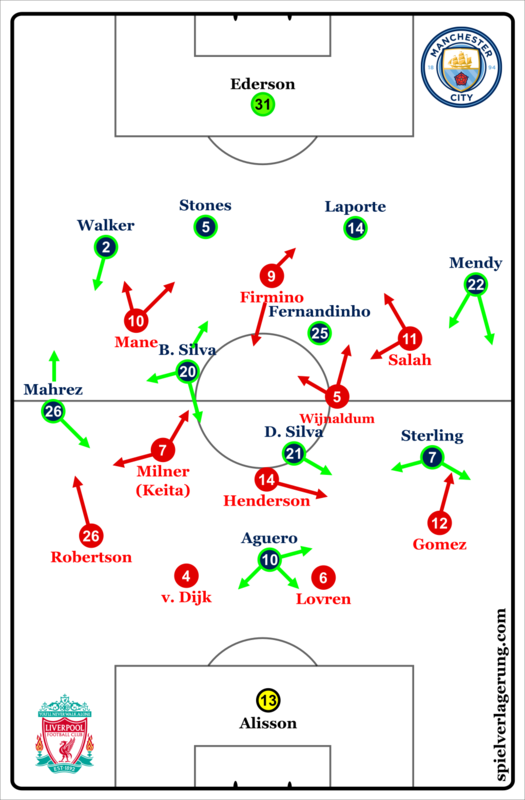 The initial stages of the match saw Liverpool maintain a considerable portion of possession and subsequently reveal some key aspects of their attacking play against City’s midfield press. In standard Klopp fashion, their pressure of Manchester City to start the match prompted some rushed attacks and poor decision making from the visitors, allowing Liverpool to secure possession within City’s half to establish their own attacks. During Manchester City’s deep build up that occurred from goal kicks and recoveries of possession close to their own goal, Firmino aligned himself between the centre back pairing, cutting off the option to the other centre back if possible. Salah and Mane forced balls centrally using their cover shadow to block off passing lanes into their respective fullback. In the instance of Mane pressing for example, Salah tucked into an intermediate position between the ballfar fullback central player. With Milner or Wijnaldum moving up to support, each of them remained a few meters back to encourage passes central into either Fernandinho or Bernardo, who formed a double pivot for this match. As the ball was played into one of them, the central player moved to pressure and aim to win the ball. The first ten minutes saw Liverpool have considerate success in these sorts of ball recoveries, particularly due to the short distances between centre backs and midfielders, encroaching the space in multiple directions as Firmino moved to backpress for instance. City’s most probable form of escaping Liverpool’s press came through their fullbacks, as when they moved the ball from one side to the other at a decent tempo, the far side fullback was open to receive from the centre backs or Ederson. Early on, Robertson stepped up and left Mahrez to apply pressure onto Walker in this sort of instance. However, this was only temporary during Liverpool’s high press, since Sterling and Mahrez each remained high up the pitch to pin their respective player back in their defensive line, affording space for Walker or Mendy to advance forward upon reception. Due to City’s impatience in attack, Liverpool were able to win back possession far from their goal while their opponents were still spread from their positional attacks. With a lack of major counterpressing presence for City, Liverpool were able to recirculate possession at will after recovering the ball. From here, they could enter their respective shape for their matchplan. Shifting from their customary 4-3-3, each of the fullbacks took up higher starting positions to permit Salah and Mane to occupy more interior positions closer to Firmino. The fullbacks occupied a line just behind the front three, moving Sterling and Mahrez into deeper spots, with Wijnaldum positioning himself in the right halfspace between Salah and Firmino. Henderson and Milner (and then Keita) each dropped deeper just in front of or into the defensive line, with Milner/Keita occupying wide left positions, vacated due to Mahrez’s decision to track Robertson as opposed to remain in his zone. Henderson occasionally ventured rightward, but his tendency was to remain more central as a fulcrum for Liverpool’s attacking play. Liverpool’s bolstered occupation of deeper lines ensured stable circulation in build up, with numbers higher up providing more options to progress forward. Considering the speed of Liverpool’s frontline, aerial balls in behind from the center midfielders were frequently used to try and create chances against City. With Silva and Aguero remaining higher, Manchester City struggled to get substantial pressure to the ball as Liverpool outnumbered City in these zones 4v2. With Milner remaining wider, they could circulate from side to side without much hindrance. The next passes could then find players in gaps of City’s midfield as they were shifting, relocating the ball into higher lines. More commonly, one of the dropped central midfielders played vertical flighted balls in behind City’s defense, who held a high line to restrict the amount of space available in midfield. As a result, Liverpool’s main avenue of penetration came from these passes if pressing wasn’t their playmaker early on. Despite the good start, Liverpool had nothing to show for it besides territorial gains and a couple of half-chances. Manchester City were reluctant to amplify pressure early as one part of their generally conservative strategy. This mixed with City’s poorly timed forward passes during early build up that were well anticipated by Liverpool’s pressure, and the Reds controlled the flow of play early on. A return to the sorts of matchplans that were common during Guardiola’s stint at Bayern, particularly during away fixtures in the Champions League. In these fixtures, rather than start with a high intensity and trying to dominate the opponent from the first whistle, his teams take a more measured and gradual approach toward getting into the match, taking the first moments to adjust to their opponent’s tendencies and see which spaces will be most available to attack. In addition, the structures that were implemented in these matches had a more stable focus, with emphasis on counter attack prevention and more patience. This match reflected similar principles. City’s main base structure in possession was a 4-2-3-1, with Bernardo and Fernandinho forming a double pivot and Silva functioning as a traditional attacking midfielder. Pass selection was shorter and more patient, with more side to side circulation and any long passes being played by Ederson as opposed to any of the defenders. Early on because of a lack of patience, City subjected themselves to a couple of counter attacks and threatening Liverpool attacks, moments which visibly irritated Guardiola and were reduced as the match went on. The overall horizontal distance between the back four was comparatively short, stabilizing their early possession and minimizing risk if possession was conceded early due to shorter transitional distances to track Liverpool’s attacking trident. Positionally, the locations of Bernardo and Fernandinho provided more references for Salah and Mane to account for during their pressing. By holding their positions at the midpoints in between each of the front three, both the physical and mental demands of implementing their high pressure were increased, due to more changes of direction in pressure, greater distances, and more references to account for. As City methodically moved the ball, they eventually could not cut off either the wings or the central option, opening up at least one of them to move forward and beat the press. In addition to passes being shorter, the overall decision making among City’s players in attack was also on the more conservative side, in that the wings were the primary medium for advancing up the pitch for the defending champions. The reasoning behind this is twofold. In addition to the open wing spaces found as a result of City’s circulation against Liverpool’s press, but also containing counter attacks is easier on the wing when possession is relinquished. This is because the field boundaries reducing the overall playing angle for each player, alongside being further from the goal than being on the same horizontal line while being closer to the field. To put it more simply, using the wings in attack not only capitalized on one fault of Liverpool’s pressing, but it also reduced the risk of City’s attacking overall. By breaking through Liverpool’s initial press in this fashion, Manchester City could move up and develop attacks in higher spots, while coercing Liverpool to operate in more of a midfield press rather than close to their own goal. Given the objectives of the match and how Guardiola wanted to be more cautious, this makes plenty of sense. Even if City were more focused on the wings, each wing had their own unique profile, similar to what was implemented in their opening fixture at the Emirates. Starting with the left, Mendy, Sterling, and Silva formed an axis that was centered on combination play to progress forward. Mendy and Sterling alternated between occupying the wing and the left halfspace. In general, Mendy occupied the wing during the first phases of build up and chance creation, moving centrally when the ball was on the opposite side. Sterling adjusted in relation to Mendy to ensure they were never on the same vertical line. To the right now, ya’ll. During early build up, Kyle Walker was reluctant to move toward the touchline, thus giving Mahrez ample room to check deeper and receive the ball off of Stones. Once Mahrez received, the isolation he was granted afforded him space to dribble forward and gradually progress the ball up, before playing it to another player. As passes were directed toward Mahrez, Bernardo Silva vacated his spot as the second member of a double pivot to join higher lines and support Mahrez. 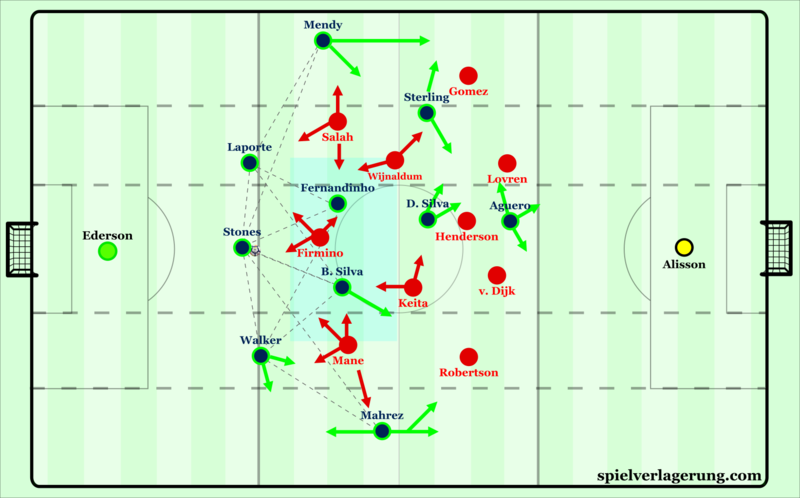 The 4-2-3-1 turned into a mesh of formations as all sorts of situations presented themselves. Manchester City’s passing network and movements with the Bernardo-Fernandinho double pivot against Liverpool’s press. Yet the wing usage was not as fruitful as intended. Once on the ball, Sterling’s inside dribbles triggered Mendy’s runs to move beyond him, alongside Aguero offering options ahead of him for possible lay offs into Silva. Mendy in possession frequently looked toward David Silva as an avenue to create, but he struggled to cope with the abundant energy of Liverpool’s midfielders when pressuring him and many of these attacks went astray. The frequent tendency to dribble before pass in this match allowed Liverpool to be able to recover at the very least, double team in pressure at the best. With Mahrez’s dribbles, Robertson performed quite well in preventing him to cut into the centre, forcing him down the line to fire off manageable crosses. The opposite side had a similar focus, with Liverpool able to stagger themselves in the penalty area to effectively prevent cutbacks from being a source of goals. Since each team recognized how quickly they could concede, the match was cagey on both ends, each with their own defensive adaptations whether in possession or out of it. While these tactics succeeded in cancelling each other’s strengths out, they did not succeed in giving one side the edge over the other. Given City’s recent struggles against Liverpool, that was a step they were evidently willing to take. Considering the first half registered zero shots on target for both teams, the attacking output could only increase. To start the second half, Ederson took more of a prominent role in City’s build up due to a series of goal kicks that arose after the home side were able to successfully recover possession from Manchester City aiming to play increasingly vertical. This development was well anticipated by Liverpool’s defensive line, with the following moments creating some shaky moments for City. The balance and flow of the early second half was quite similar to the first however, with not many major shakeups from either team. As each team became more vertical, the propensity to counter attack from each team increased as well. More long, marauding runs from midfielders with ball followed quick combination sequences to esacpe the hectic counterpressing as each side chased the opening goal. Both teams had a series of chances that hardly stressed out their respective defenses and Brazilian goalkeepers, but the newfound dynamic of the match called for changes from both teams. Gabriel Jesus and Leroy Sane entered, alongside Daniel Sturridge for Liverpool. Despite these changes, neither team found themselves with a golden chance to secure the three points until Leroy Sane was fouled in the penalty area during minute 85. A speculated reason for Guardiola choosing Mahrez over Gabriel Jesus (who initially put himself over the ball): over the summer, it is likely that Jesus took several penalties against Alisson during training over the course of their time in Russia, as they were preparing for the possibility of a penalty kick shootout. From this, Alisson may have developed an extensive account of Jesus’ tendencies from the spot. The reverse may also be true, but Guardiola perhaps chose in this example to avoid the potential game of imperfect information. His faith in the Algerian was not rewarded, squandering his chance to give his team three points through hitting the ball over the crossbar. No other significant chances came about after the miss, leaving the points shared between both teams. Guardiola’s hesitance to have his team open up and potentially expose themselves to transitional risk proved to both limit the attacking threats of Liverpool and curtail the success of their own attacking. Consequently, this tight affair provided few fleeting moments of excellence from both teams. Despite being strategically interesting given the potential title consequences of this match, it was quite the contrast from the classic fixture from earlier this year. Heading into the second international break, these two clubs plus Chelsea are even at the top of the table with 20 points. The developments of each as the season progresses will be of great interest as they all vie for the league title in addition to other domestic and continental honors. A very Mourinho-esque performance from City.